Chimamanda Ngozi Adichie Announced as Wellesley College’s Commencement Speaker; Exercises will take place on Friday, May 29, at 10:30 a.m.
Wellesley, Mass. – Renowned novelist Chimamanda Ngozi Adichie will address the members of the Wellesley College Class of 2015 and an international audience of their family and friends at Wellesley’s 137th Commencement Exercises on Friday, May 29, at 10:30 a.m. Students drive Wellesley’s commencement speaker selection process and, in keeping with Wellesley tradition, Adichie was announced as the speaker at the College’s “Senior Soiree” on Thursday, April 9. Chimananda Ngozi Adichie is the author of the novels Purple Hibiscus, which won the Commonwealth Writers’ Prize and the Hurston/Wright Legacy Award, and Half of a Yellow Sun, which won the Orange Prize and was a National Book Critics Circle Award Finalist; a New York Times Notable Book; and a People and Black Issues Book Review Best Book of the Year. She is also author of the story collection The Thing Around Your Neck. Her latest novel is Americanah, which won the National Book Critics Circle Award for Fiction, the Chicago Tribune Heartland Prize for Fiction, and was named one of the New York Times Ten Best Books of the Year. 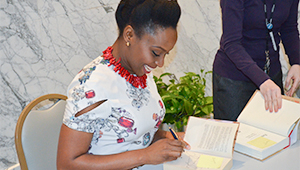 Adichie’s work has been translated into thirty languages and has appeared in The New Yorker, Granta, The O. Henry Prize Stories, the Financial Times, and Zoetrope, among other publications. Adichie, the recipient of a MacArthur Foundation Fellowship, divides her time between the United States and Nigeria. High-resolution photographs available. For press credentials please email mediarelations@wellesley.edu. Since 1875, Wellesley College has been the preeminent liberal arts college for women. Known for its intellectual rigor and its remarkable track record for the cultivation of women leaders in every arena, Wellesley—only 12 miles from Boston—is home to some 2400 undergraduates from every state and 75 countries.